Science Culture: A Lesson for Nuclear Safety Culture? The article goes on to describe how in the scientific community the ability to publish is key to professional recognition, advancement and award of grant money. There is enormous pressure to publish first and publish often to overcome “cutthroat competition”. So how do retractions of scientific papers relate to nuclear safety culture? In the most general sense the presence and impact of “pressure” on scientists reminds us of the situation in nuclear generation - now very much a high stakes business - and the consequent pressure on nuclear managers to meet business goals and in some cases, personal compensation goals. Nuclear personnel (engineers, managers, operators, craftsmen, etc. ), like the scientists in this article, are highly trained and expected to observe certain cultural norms; a strong safety culture is expected. For scientists there is adherence to the scientific method itself and the standards for integrity of their peer community. Yet both may be compromised when the desire for professional success becomes dominant. The scientific environment is in most ways much simpler than a nuclear operating organization and this may help shed light on the causes of normative failures. Nuclear organizations are inherently large and complex. The consideration of culture often becomes enmeshed in issues such as leadership, communications, expectations, pronouncements regarding safety priorities, perceptions, SCWE, etc. In the simpler scientific world, scientists are essentially sole proprietors of their careers, even if they work for large entities. They face challenges to their advancement and viability, they make choices, and sometimes they make compromises. Can reality in the nuclear operating environment be similar, or is nuclear somehow unique and different? * C. Zimmer, “A Sharp Rise in Retractions Prompts Calls for Reform,” New York Times (Apr. 16, 2012). Things have gone from bad to worse for Fort Calhoun. The plant shut down in April 2011 for refueling, but the shutdown was extended to address various issues, including those associated with Missouri River flooding in summer 2011. The plant’s issues were sufficiently numerous and significant that the NRC issued a CAL specifying actions OPPD had to take before restarting. “Commissioner Apostolakis: . . . what I would be more interested in is to know, in your opinion, what were the top two or three areas where you feel you went wrong and you ended up in this unhappy situation? Note the nexus between the culture and the CAP, with the culture evolving to accept a view of the CAP as a work management system rather than the primary way the plant identifies, analyzes, prioritizes and fixes its issues. Notwithstanding Fort Calhoun’s culture creep, the mechanics and metrics of an effective CAP are well-known to nuclear operators around the world. It is a failure of management if an organization loses track of the ball in this area. I have no special insight into this matter but I will try to read the tea leaves. Recently, the NRC has been showing both its “good cop” and “bad cop” personas. The good cop has approved the construction of multiple new nuclear units, thus showing that the agency does not stand in the way of industry extension and expansion. * Fort Calhoun Station Manual Chapter 0350 Oversight Panel Charter (Jan. 12, 2012) ADAMS ML120120661. ** NRC Public Meeting Transcript, Briefing on Fort Calhoun (Feb. 22, 2012) p. 62 ADAMS ML120541135. 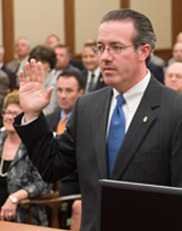 “Booth Goodwin, the U.S. Attorney in Charleston, W.Va., wrote in the plea agreement that "‘laws were routinely violated’ by Massey because of a belief that ‘following those laws would decrease coal production.’"
Sometimes it takes a lawyer’s bluntness to cut through all the contributing circumstances and symptoms of a safety failure and place a finger directly on the cause. How often have you seen such unvarnished truth telling with regard to safety culture issues at nuclear plants? The above findings are more typical of what one sees in nuclear plant inspection reports and which are attributed to lack of strong safety culture. This in turn triggers the inevitable safety culture assessments, retraining, re-iteration of safety priorities, etc that appear to be the standard prescription for a safety culture “fever”. But what - continuing a not so good medical analogy - is causing the fever? And why would one expect that the one size fits all prescription is the right answer? To us it gets down to something that isn’t receiving enough attention. What are the root causes of the problems that are typically associated with a finding that safety culture needs to be strengthened? We will share our thoughts, and ask for yours, in an upcoming post.